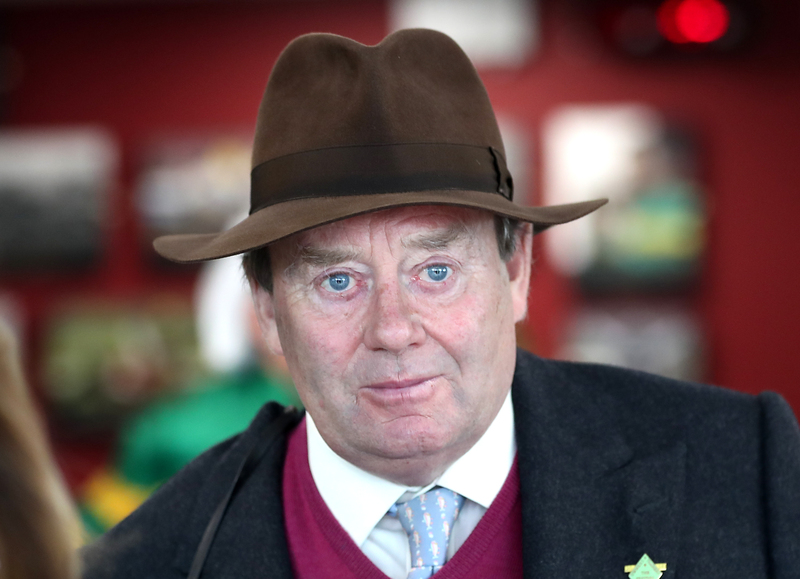 Nicky Henderson has been forced to rule several stable stars out of intended engagements this weekend as they do not meet the vaccination criteria set out by the British Horseracing Authority in its decision to resume racing following the equine influenza outbreak. The sport was rocked last week when it emerged three horses – which subsequently rose to six – had tested positive for the highly-contagious virus at Donald McCain’s stable in Cheshire. The BHA quickly enforced a six-day shutdown of racing in Britain and placed over 170 yards on lockdown in an attempt to halt the spread. The news over the weekend was largely positive – with around 1,500 swabs from horses across the country returning negative – before four horses at Simon Crisford’s yard were also found to have contracted equine flu on Sunday evening. The BHA announced late on Monday that racing would start up again, but with strict biosecurity controls in place – with one of the key stipulations that no entries or declarations will be accepted from horses that have not been vaccinated in the previous six months. Henderson is delighted the sport will recommence – but revealed likely favourite Santini will not be able to run in the Reynoldstown Novices’ Chase at Ascot on Saturday, while Christmas Hurdle heroine Verdana Blue cannot take up her entry in a fast-track qualifier for All-Weather Championships Finals Day at Kempton. Henderson told Press Association Sport: “It’s been a frustrating two weeks, as we were snowed in before this. Obviously we are all delighted with the news, as this is what we wanted to hear after everyone had looked at the situation. “We are only just getting our results back, but I gather they are all OK. We have still got some more to come, but I imagine they will be all right. “We have got one or two frustrations because of the vaccinations – it has caught out one or two horses as they have just fallen outside of the window. We have just got to juggle a few things around, which is frustrating. Under the rules set out, no horses will be able to run until seven days after being given a vaccination. Henderson added: “There are a few that were due to run this weekend that can’t run like Santini, and Verdana Blue can’t run in her fast-track qualifier, so that takes her out of her Good Friday race. “Yellow Dockets can’t run in the Grade Two at Sandown and Beware The Bear is another who can’t run in the Grand National Trial at Haydock, but we could reroute him to the Eider Chase. “We have just got to get our heads round a few things. We can sort them out today and they would be able to run next week, but that it is no good for many of them as for some these were the only races they could run in. “You only have 10 positives tests (for equine flue) compared to all the negatives and with the percentages you had to go (resume racing) now. The Seven Barrows trainer also confirmed via his Twitter feed that Top Notch would not be in action at Ascot. One trainer in an even worse position than Henderson is Olly Murphy, who has not vaccinated the majority of his horses since last July. “It’s absolute madness. I worked for Gordon Elliott for five years, he vaccinates his horses once a year – which is completely legitimate – so I’ve always done the same,” said Murphy. “Barring a handful, I vaccinated all my horses on July 12. I’ll now have to vaccinate them all again and although they’re saying we can run them again seven days later, it will probably be 10 to 14 days before I have another runner as they’ll need a bit of time to get over it. “I know Paul Nicholls vaccinates all his horses in January, which is fine, but there’ll be a lot of trainers in the same position as we are. “I have a hundred horses and I now need to ring all the owners and tell them that even though racing is back on, their horses can’t run. “We’re tying to run a business here. Joe Soap can go down the betting shop and have his bet again, but for us it’s a disaster. “They’ve basically changed the rules at 11.30pm last night and a lot of trainers are no better off this morning than they were yesterday. Former champion trainer Nicholls said: “I’m delighted that we are racing again, but I know not everyone is happy due to a few things. But we are racing again and that is most important thing. “From my point of view our horses our horses get done twice a year and they all had it (vaccinations) in January. We’ve got lots of horses to run so we can now get on with it. “I was sitting on the fence a bit – I would have been quite disappointed if racing had not been giving the go-ahead, but in the circumstances something had to be done. They have come up with a sensible answer in a difficult situation. “Of course I sat up waiting last night and my phone was constantly going off. We have to make lots of plans of what might run here and there. You can’t stop thinking and you have to be thinking about it all the time. Gold Cup-winning trainer Colin Tizzard also defended the BHA’s handling of the situation. He said: “Looking back at it, you have got to take your hat off to them as they have stood their ground. “It has taken a bit of sorting out and we did start to push them a bit to get going, but now they have it is good to have racing back. They have got together and put the right races on. “We vaccinate our horses twice a year and they were all done around Christmas and in the first week in January. We’ve not had any word from the BHA that we are clear, but then we have had no word we are not. Alan King will be able to send his horses to the racecourse, having vaccinated his string over the Christmas and New Year period. He said: “Obviously we are pleased to be back and it is a relief. The horses are all ready to roll and get going again. It is time to move on now, so let’s kick on. “All my horses were vaccinated in either the Christmas week or the first part of January – all before I went on holiday. I nearly didn’t do them at that time as they were all in such good form and it can just take the edge of them, but thank goodness I did.